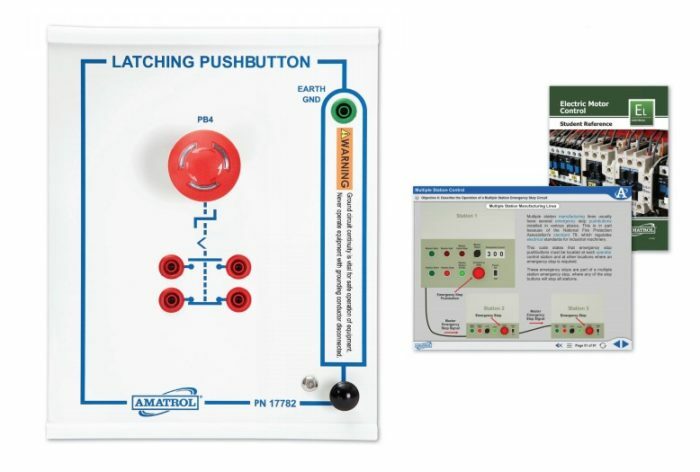 Adding to the Electric Motor Control Learning System (85-MT5), Amatrol’s Latching Stop Pushbutton Learning System (85-MT5HSL) teaches the function and operation of an emergency stop pushbutton. The Latching Stop Pushbutton exists using a global standard, which safely stops machines for various applications using three stop categories. The motor control training expansion features a stop pushbutton set within a heavy-duty, 11-gauge steel slide panel built to stand up to frequent use. This industrial training system also features world-class curriculum that covers stop categories and priorities, types of emergency stop devices, and three-wire motor control circuits. Learners can then directly apply this theoretical knowledge to practice hands-on skills such as connecting and operating a latching pushbutton as an emergency stop. Learners can also practice sending a signal to a remote indicator when pressed.